Bring a colonial feel to your present-day style home with the SomerTile 8.75x8.75-inch Suffolk East Porcelain Floor and Wall Tile. This impervious tile has slight variation along the edges and offers a one-of-a-kind look. With tones of light tawny that vary throughout every piece, no two looks will ever be the same. This tile offers endless design possibilities when paired with other products in the Americana series. Use this matte tile in all indoor and outdoor locations, including walls, floors, fireplaces and patios. Dimensions 5.0 In. X 4.5 In. X 0.25 In. looked everywhere to try to replace a few sections of my Daltile Mardi Gras which had been damaged by water over the years just in front of and outside of my shower door. Mardi Gras was discontinued years ago... this was the closest match. Ordered this tile to create a faux shower mat to cover (replace) broken pieces. This is a beautiful tile. Sort of a subtle but sunny/peachy yellow. Just perfect! Not what I had in mind for the kitchen floor. It was way too light but very nice quality. "I need a tile that has a DCOF wet of .6 or better. What is the DCOF rating of the 8.75 X 8.75 tile?" Unfortunately, we do not have a DCOF rating available for this tile. However, the COF rating for this tile is .80 and above, which is recommended for commercial applications to meet or exceed ADA (Americans with Disabilities Act) Guidelines and is highly skid resistant. "The details state the tile dimensions as 8.75 x 8.75 x.45, but the spec state the dimensions as 5.0 x 4.5 x.25. Which is true?" We apologize for the confusion- the sample tile measures 4.5" x 5" and the actual tile measures 8.75" x 8.75". "Do you get only one (1) sample tile for $. This seems like a lot of money for one tile. Also, since they vary in color it would be easier to judge the colors if you get a few sample tiles. Thank you for answering my question"
If you order the sample option, you will receive one sample. To get an idea of the variation of this tile, we would recommend purchasing a full case. "I am a little confused. I have 72 square feet. How many boxes of tile would I need." Since each case of 20 tiles covers 10.87 square feet, you will need at least 7 cases to cover 72 square feet. We also always recommend purchasing at least 10% more than you need in case of cuts and breaks. "I am looking for a tile that has soft orange and beige tones. This tile looks like a good fit but it is described as brown and beige. Please clarify. Ty. Also, how many square feet will one box of 20 tiles do? Thank you." This tile does feature some tones of tawny brown and beige, so it should work for your project if you are looking for slight orange tones. Each case of 20 tiles covers 10.87 square feet. 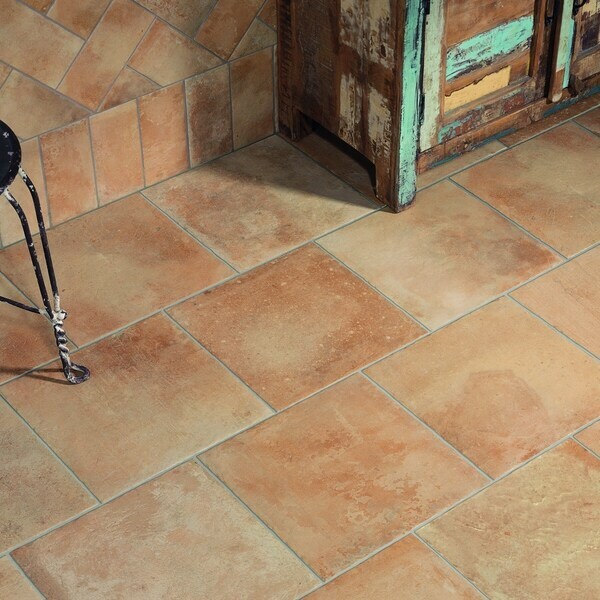 "On line, these look redish/yellow/brownish like Saltillo tile. Is there yellow in the mixture?" The tones within this tile are a warm beige. Yes, some of the tiles have a golden yellow tone. "Is it really $**** per tile??? Way to high of a price"
This listing is for a case of 20 tiles.